This essay plots the shared intellectual concerns of the critic Lawrence Alloway and the artist Eduardo Paolozzi, focusing on their mutual interest in the fusion of popular culture and fine art, the relationship between the individual and the post-war urban environment, and the notion of analogical feedback developed from the emerging science of cybernetics. In his 1959 essay ‘City Notes’, Lawrence Alloway (1926–1990) set himself against the modernist impulse towards an urbanism that insisted on efficient, simple, rational and unified design – one synchronised with industrial modernity. Declaring that ‘The mass arts contribute to the real environment of cities’, Alloway expressed a perspective that might have seemed radical to modernist architects such as Le Corbusier and Walter Gropius.1 Indeed, this succinct claim was, in part, politically aimed at the urban planners of his own city, London, and written in direct response to a photograph of Piccadilly Circus, published in Ernö Goldfinger’s and E.J. Carter’s book County of London Plan (1946), which was accompanied by the caption ‘architectural squalor’. Goldfinger’s and Carter’s text advanced a vision of the post-war reconstruction of London that included the removal of elevated Victorian railways and the creation of housing estates modelled on Le Corbusier’s ideal of volumetric towers separated by liberal amounts of open space. In the case of the particular photograph that interested Alloway, the planners proposed to eliminate the clutter of abundant and competing visual displays in the city’s public spaces. London, their text suggested, would be an improved city without its many advertisements contradicting and competing with each other. In Piccadilly Circus, the writers sought to strip the visual cacophony from the underlying Regency architecture. Alloway, however, advanced a different vision of the city, one in which urban planning and the popular were reconciled. The popular environment, wrote Alloway in ‘City Notes’, should be appreciated for embracing an ever-expanding array of mass cultural technologies. Film, advertising, comics, television and pulp cover art were celebrated by the critic, who classed them all together as ‘the popular arts’.2 This was a view not entirely dissimilar from the ‘society of the spectacle’ which the situationist writer Guy Debord would later elucidate.3 However, in Alloway’s model, there is no readily apparent consideration of the role of capital in the production of spectacle. Instead, his view was based on the detection of parallel developments and systems in the diversification of media. As its variety, density, and quantity expanded, he claimed, so did its audience, and so culture became democratised. In Alloway’s writing, two technologies embodied this new media ideology: the CinemaScope screen, with its dramatic expansion of the field of vision, and the windshield of an American car, which provided a panoramic view of the city.4 Both the windscreen and the movie screen were, according to Alloway, communication devices through which images of the city are formed and transmitted. The popular audience who receives these images is locked in an interactive loop with the realities constructed both in the movies and in the city itself.5 In Alloway’s analysis of the relationship between the public and the popular arts, spectacular culture and popular sensibilities interact and co-evolve. The public environment and media environment are treated as parallel systems. In situating Alloway’s ideas about the ‘popular arts’ within post-war London’s artistic and political cultures, it is important to explain the role that the emerging science of cybernetics played in the formation of Alloway’s critical thinking, in particular its adherence to comparisons and analogies as processes by which connections between distinct entities can be mapped. In this passage, Wiener details a complete loop through man and the physical, social and informational environment in which he lives. That Alloway had also integrated some of these ideas into his thoughts on mass media and the arts is abundantly clear when he wrote that ‘Popular art offers imagery and plots to control the changes in our world. Everything new in our culture that changes is the material of the popular’.10 This statement might be the clearest statement of Alloway’s critical ideology, and one that advances a cybernetic dialectic: culture provides materials as fuel for a media-engine while, reciprocally, that media-engine evolves to control changes in culture. However, it is the high value placed on analogical thinking, derived from the comparison of organic, mechanical and social systems in cybernetics, that rises to the surface in Alloway’s writing. We can demonstrate the similarity of the critic’s thinking to that of Wiener and his followers by comparing a typical cybernetic analogy to one posited by Alloway. In the first instance, analogy forms the basis for an analysis of the operations of a locomotive and a human digestive tract, for example. One might say that just as a train’s speed is determined by the interaction of its mechanical engine and the input of coal of variable quantities, a human body’s function is regulated by a sequence of organs and affected by the quantity of food consumed.11 Similarly, in the case of Alloway’s analysis of culture, analogical thinking is extended to comparisons of the fantasy worlds projected in film, television and print, and the actual world of the city, tangibly constructed and physically experienced. Noting the topicality of fantasy in the popular arts, Alloway makes a claim for its significance: ‘There is, in popular art, a continuum from data to fantasy … The mass media give perpetual lessons in assimilation, instruction in role-taking, the use of new objects, [and] the definition of changing relationships.’12 In this way, where others might insist on a clear distinction between the real and the fictional, Alloway sees a productive relationship and connection between the actual and the projected. Analogy, here, is not a simple comparison, but a generative operation. It is generally agreed that the impact of Alloway’s ideas was greatest (or at least most abundantly visible) in his close association with the Independent Group, contributing to the group’s perceived vanguardist ethos as well as its pursuit of an art that is receptive to and engaged with mass culture.13 However, I wish to propose that it was Alloway’s understanding of the cybernetic operation of analogical analysis that became his most influential contribution to the Independent Group and, indeed, to post-war British art in that it not only stimulated interest in bridging high art and mass culture but also represented a logic and a sensibility that structured the practice of a number of artists. Despite the undeniable fascination with the so-called ‘aesthetics of plenty’ presented by America, I wish to suggest that Alloway and the Independent Group were invested in exploring these de-territorialised media-worlds of fantasy and potentiality conveyed through American imagery, only through the local analogue of post-war London.14 Indeed, in his aforementioned description of a car’s windscreen as analogue for the CinemaScope screen, Alloway focuses his readers on the ‘spatial experience’ of the city-as-media environment, a direct echo of the environment described by Wiener as one part of a feedback system in which man both receives information and reacts in adaptive response to it. For the purposes of this essay, the work of Eduardo Paolozzi (1924–2005), singled out by Alloway several times, will serve as a case study in a post-war British artistic culture informed by this conception of ‘spatial experience’. Paolozzi’s work offers a particularly good case study of how the analogical reasoning of cybernetics feeds into a process-oriented artistic practice. His was a praxis culled from the vast and variable spectacle of mass media – the very same ‘popular arts’ which Alloway encouraged his contemporaries to reappraise. At the same time, Paolozzi’s work is rooted in an immediate, subjective and psychological experience of the city and its spaces. 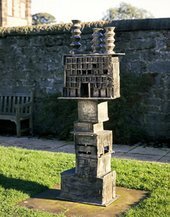 It is, perhaps, Paolozzi’s lifelong, exhaustive collecting of mass culture that allows us to draw a direct line to Alloway. Begun in the late 1940s, Paolozzi’s collection provided the material from which his collage works and sculptures were made. Comprising print material, technology, toys, and other popular products, the collection was archived according to a peculiar taxonomy – airplanes, automobiles, film stars, gears, animals, robots, art objects – aligning it more with the sensibility of a child or consumer of popular goods, than that of an archivist.15 Paolozzi’s collage books were the earliest by-product of this collecting habit. These books are, in one sense, merely scrapbooks: a means of gathering found material into book format. However, they are also workbooks in which Paolozzi can be seen working out the relationship between his art and the popular arts. Indeed, in a discernable echo of his collecting and gathering process, the artist pasted numerous images of metal processing and reclamation in his collage books. In these images, a magnet is employed to draw out particular types of scrap metal. Fundamentally, Paolozzi’s processing of mass cultural fragments was biased towards figuration and based in the re-combinatory use of image fragments. For instance, in an early print entitled Automobile Head 1954–62, there is an amalgamation of disjunctive juxtapositions of image parts that adhere into a head (fig.1). The artist created a composite figurative form from illustrations of automobile engines, probably derived from the cut-away diagrams that populate popular mechanics magazines. The parts were angled, repositioned, transferred into a figurative shape, and transposed into lithography, where they became interlocking mechanisms. In this way, a composite body is built from an amalgamation of material fragments. The link between such a composite figure and the ‘Everyman-viewer’ described by Alloway becomes increasingly apparent when one considers the metaphors built into the artist’s images. These heads are, after all, receivers of mass cultural images which are literally shaped by them, while also becoming engines of interacting mechanical parts. In Paolozzi’s hands, then, collage functions as an analogy for the perceiving subject’s reception, processing, and response to its media environment. It is significant, then, that Paolozzi’s use of collage as a figurative technique was developed and extended in his sculptural practice. In his 1950s bronzes, Paolozzi adapted the lost-wax method to behave like collage. He invented a means of constituting figurative sculpture from dissonant found material. Instead of moulding his figures out of wax, Paolozzi began with slabs and irregularly shaped masses of clay, into which he pressed various three-dimensional objects from his collection. Wax was poured over the clay surface before the wax blocks were treated with a refractory and heated to form a mould.16 These moulds were pieced together to form vertical figurative constructions in a manner that echoes collage. In this way, the material of popular culture remained present in his sculptures transmitted into a conglomerate of contiguous shapes and surfaces. For example, Tyrannical Tower with Thorns of Violence 1959 (fig.2) is a modular, architectonic, vertical figure, both containing and functioning like a building. Its shape evokes a post-war variant of the Corbusian approach to high-density housing; namely the modular towers of London public housing of the late 1950s and 1960s. Indeed, the reformation of the London skyline seems to be the subtext of this work (and others similar to it). It was in these same years that the London County Council began to erect modular concrete or brick towers of housing exceeding six stories. The towers pierce the low London skyline like geometric, modular thorns, or like figures in an unfamiliar landscape. The sculpture receives information in material form within a feedback loop from the urban environment, and responds adaptively to it by taking its resonant form. The earlier prefabricated housing units (which preceded these concrete towers) are also evoked in Tyrannical Tower. The haphazard, hobbled-together arrangement of boxes in the base and the piecemeal appearance of the sculpture’s modular sections simulate the rapid on-site assembly of prefabricated segments into rudimentary, modular units. In this way, the early residential building types of post-war London underlie Paolozzi’s approach to figurative sculpture. These are all tentative structures which the figure inhabits and is integrated into. However, the sculpture is not a representation of that architecture. Rather, it stands in for the cybernetic subject engaged in spatial experience. It is constituted by its environment and speaks back into it. As such, the sculpture is analogical at three interlocked levels: firstly, it parallels the process and architecture of post-war reconstruction; secondly, it stands in for the subjective experience of such an environment; and finally, it is a repository for material pop culture retained in negative in the textured metal. One might wonder, then, just what Paolozzi’s attitude toward post-war London might have been. Did it coincide with the viewpoint expressed by Alloway in ‘City Notes’? Alloway’s proposition that the worlds of fantasy present in popular culture interact dynamically, even dialectically with material reality provides a starting point. In this regard, close analysis of the artist’s taste in pop cultural fantasies is revealing. In the juvenile literature, science fiction, popular science magazines, and children’s toys that he collected, several fantastical figures recur and, having been collected in mass cultural forms, re-emerge in his art. These are: the monster, the cyborg and humanoid robot, the hermaphrodite, and the bodybuilder. Alloway noted Paolozzi’s attention to such figures in the essay ‘Artists as Consumers’. Identifying the serious study Paolozzi makes of monsters in popular culture, Alloway observes the significance of such monsters in creating and sustaining ‘suppressed values [in] “covert culture”’ which are not outwardly acknowledged and accepted by a society but nonetheless have an ‘ebullient’ existence and significance within a culture.17 In Alloway’s ‘popular arts’, these and other mutants are presented as radically ulterior species – metamorphosed from the normative human body into an entity with an unstable, new identity. In Paolozzi’s hands, they are all biological mutants who provide a means of incorporating the pop cultural idea of self-fabrication – the self-willed invention of a new identity – into figurative form. In one of the collages from the series later entitled Bunk, Paolozzi places the cover art from copies of Popular Mechanics and Unknown Worlds next to each other.18 This seems an unlikely, even jolting, juxtaposition of a popular magazine primarily devoted to explaining technology and a pulp anthology of fantasy fiction. There are, however, covert connections between them. The Unknown Worlds cover dramatises the arrival of a fantastical gnome, a monster whose body is deviated from that of a human. Emerging from a curtain into the foreground, he moves between fictive realms. Had he written about this specific work, Alloway might have seen a metaphor for the reader’s encounter with the fantasy fiction genre, entering an ever more unrealistic, unnatural fictive world, where characters and events only provisionally resemble our own lived reality. In the illustration, this distortion of reality is manifested as extreme anatomical exaggeration and deformity of the shape of these monster-gnome bodies, signalled by highly pronounced, out-of-scale facial features. They are, in a sense, icons of the genre’s fantastic deviation from reality. They are radically other. In the post-war British context, however, their placement by Paolozzi next to an aeronautical scene that has evidently required mid-flight evacuation suggests reading them (according to Second World War Royal Air Force slang) as ‘gremlins’ – mythical, mischievous sprites who caused otherwise unexplained mechanical in-flight mishaps. They are, in other words, mutant creatures with specific meanings in a local cultural imaginary. Significantly, it is a simple juxtaposition that creates a relationship between the two images. This potential subtext emerges out of analogy. Paolozzi’s collage compares these monster figures with another type of mutant, namely the mechanical man or cyborg. In the adjacent Popular Mechanics cover illustration, a pilot is depicted wearing life-supporting aeronautic gear. Strapped into an ejection seat and wearing an oxygen-supplying helmet, it is a scene in which technology aids and augments his body’s biological functionality. In this sense, he might be classed as a bionic human, an organic body enhanced by electromechanical elements. However, one should not rush to advocate the view that Paolozzi was a gender radical avant la lettre. Works such as Robot are fantasy fabrications which turn towards the dystopian as easily as they gesture towards utopian possibilities. Furthermore, a distinctly privileged position for masculinity is retained at the point where fantasy is reconciled most directly with the concrete realities of urban experience. One distinctly gendered mutant receives particular attention in Paolozzi’s archive and early work, the bodybuilder. His images of bodybuilders were frequently taken from advertisements for the training methods of the Italian-American bodybuilder Charles Atlas, frequently found in pulp magazines, each promising the consumer an easy means of attaining a newly muscled physique in very little time. For example, Paolozzi includes one such full-page advertisement in an early collage book. It offers the reader an image of ‘the world’s most perfectly developed man’. Below, the text tells the consumer, ‘I can make you a new man too!’ The bodybuilder, here, is developed and built into a type – a mutant who extends his masculinity by expanding his body. It is one of many such popular cultural images that appeal to the desire to remake oneself in a new image by obtaining a reshaped body. In this sense, the bodybuilder figure is similar to the other mutant figures in the artist’s figurative library. It is a sustained metaphor for identity construction – the generation of new forms of being. There is undeniably also an ironic significance to the bodybuilder figure in Paolozzi’s work. It is a self-conscious reference to the analogy of the body-as-a-building. In the case of Tyrannical Tower, the popular fantasy of self-mutation aligns with the sculpture’s engagement in the spatial, urban, architectural experience. Within a single figure, fantasy runs parallel to reality. Cybernetic thinking has been fully integrated into Paolozzi’s artistic practice in process and in form as a chain of meaning-generating analogies. A base containing the title, date and author in landscape letters. The legs as decorated columns / or towers. One is reminded here of the many photographs of Blitz-damaged London, such as those published in Picture Post during the war. The riveted torso seems to echo the structural devastation and instability of an environment such as a ‘tornado-struck town’ or Calcutta slum. This metaphorical underpinning of the Saint Sebastian sculptures is especially poignant. In Paolozzi’s language, the city is seen through the body, and the body is formed from the material city. 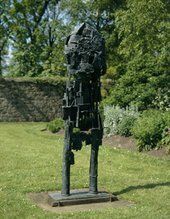 There is, then, a definite proximity between Paolozzi’s work and Alloway’s cybernetic dialectic, his analogical thinking, and his conflation of the experience of mass media and (to borrow his phrase once more) ‘spatial experience’. Indeed, it seems highly likely that both men were influenced by Wiener’s writings in similar ways and probable that the critic and artist shared their ideas on the subject with each other. However, the attitude towards the post-war city embodied in the artist’s sculptures is not necessarily equivalent to the sensibility expressed by the critic when he extols the virtues of an advertisement-laden urban environment. The difference can be summarised with a simple distinction. In the cultural geography of London, there is a significant gap between Alloway’s Piccadilly Circus and Paolozzi’s public housing sites. In the first place, the ‘Everyman’ is entertained, while the second is where he must live. Despite the utopian fantasy of self-invention that pervades Paolozzi’s early work, the title, Tyrannical Tower with Thorns of Violence, conspicuously intones the dystopian, indeed the abusive and hegemonic. Arguably, this wariness is lacking in Alloway’s writing during a period that appears at times to advance the Cold War myth of the democratising force of capitalist culture.24 Paolozzi’s ambivalence, in the end, may have been more in tune with the contradictions of post-war Britain where, on the one hand, austerity gave way to prosperity, while on the other, Empire descended into partitions and crises. Post-war London sat on a pivot between individual aspiration and social crisis. The 1948 arrival of the Empire Windrush and the birth of youth subcultures transformed the shape of British identity, yet the confrontation between these newly prominent social identity groups, by the close of the 1950s, came to a head in the conflicts of the Notting Hill Riots. This is a transformative but conflicted period. Ultimately, these internal contradictions seem more present in Paolozzi’s work than Alloway’s criticism. To extend the mechanical metaphor one final time: some systems simply function better than others. 1. Lawrence Alloway, ‘City Notes’, Architectural Design, vol.29, no.1, January 1959, pp.34–5, reprinted in Lawrence Alloway, Imagining The Present: Context, Content and the Role of the Critic, ed. by Richard Kalina, London and New York 2006, p.67. 2. Lawrence Alloway, ‘Personal Statement’, in Ark, vol.19, March 1957, pp.28–9, reprinted in Kalina 2006, pp.51. 3. Guy Debord, La Société du spectacle, Paris 1967, Society of the Spectacle, trans. by Donald Nicholson-Smith, New York 1994. Debord wrote: ‘The spectacle is not a collection of images; rather, it is a social relationship between people that is mediated by images … In all its specific manifestations – news or propaganda, advertising or the actual consumption of entertainment – the spectacle epitomises the prevailing model of social life’ (pp.12–13). 4. Lawrence Alloway, ‘City Notes’, in Kalina 2006, p.67. 5. For a more recent discussion of the principle of feedback at play in media culture see David Joselit, Feedback: Television Against Democracy, Cambridge, Massachusetts 2007, pp.38– 40. 6. Arturo Rosenblueth, Norbert Wiener and Julian Bigelow, ‘Behavior, Purpose and Teleology’, Philosophy of Science, vol.10, January 1943, pp.18–24. 7. Norbert Wiener and Arturo Rosenblueth, ‘Conduction of Impulses in Cardiac Muscle’, Archivos del Instituto de Cardiologia de Mexico, vol.16, 1946, pp.205–65. 8. In fact, Alloway noted the success of the popularisation of cybernetics when he located the first mass cultural reiteration of its ideas in an issue of Amazing Stories, published in the same year as The Human Use of Human Beings. See Lawrence Alloway, ‘The Arts and the Mass Media’, Architectural Design, vol.28, no.2, February 1958, pp.84–5, reprinted in Kalina 2006, p.58. 9. Norbert Wiener, Human Use of Human Beings: Cybernetics and Society, Boston 1954, p.17. 10. Lawrence Alloway, ‘The Arts and the Mass Media’, in Kalina 2006, p.58. 11. See Norbert Wiener, Cybernetics: Or Control and Communication in the Animal and the Machine. 12. Lawrence Alloway, ‘The Arts and the Mass Media’, in Kalina 2006, p.57. 13. See Anne Massey, The Independent Group: Modernism and Mass Culture in Britain, 1945–59, Manchester 1995. Massey provides an account of the relationship to the historical avant-garde at the Institute of Contemporary Art, while also identifying the Independent Group’s specific enthusiasms for the Bauhaus, the surrealists, and dada. 14. For a detailed analysis of the relationship between the Independent Group, American consumer culture and Cold War geopolitics see John A. Walker, Cultural Offensive: America’s Impact on British Art Since 1945, Sterling 1998. See also, Lawrence Alloway, ’Anthropology and Art Criticism’, Arts Magazine, vol.45, no.4, February 1971, pp.22–3, reprinted in Kalina 2006, p.174. The phrase ‘aesthetics of plenty’ is closely associated with Alloway, who used the term to refer to both pop artists’ mass produced objects and the images in their work, and to challenge both Kantian aesthetics and the early view of pop art as anti-art. Alloway wrote: ‘It was an extension of the capacity of aesthetics rather than the rejection of any part of it. Themes of plenty, connectivity and intimacy amended the then dominant aesthetic of scarcity, secession and alienation.’ Lawrence Alloway, ‘Anthropology and Art Criticism’, in Kalina 2006, p.174. 15. ‘The Krazy Kat Arkive of Twentieth Century Popular Culture’, unpublished catalogue, Victoria and Albert Museum, London. Exhaustive cataloguing of the majority of Eduardo Paolozzi’s ‘Krazy Kat Arkive’ collection has been conducted by the Archive of Art and Design at the Victoria and Albert Museum. 16. Fiona Pearson, Paolozzi, Edinburgh 1999. 17. Lawrence Alloway, ‘Artists as Consumers’, Image, vol.3, 1961, pp.14–19, reprinted in Kalina 2006, p.74. 19. Lawrence Alloway, ‘“Pop Art Since” 1949’, in Listener, 27 December 1962, pp.1085–7, reprinted in Kalina 2006, p.83. 21. Donna Haraway, Simians, Cyborgs and Women: The Reinvention of Nature, New York 1991, pp.149–55. 22. Lawrence Alloway, ‘Artists as Consumers’, in Kalina 2006, p.74. 23. Eduardo Paolozzi, ‘Notes from Lecture’, in Robin Spencer, Eduardo Paolozzi: Writings and Interviews, Oxford 2000, p.85. The lecture was held in 1958. 24. Serge Guilbaut, How New York Stole the Idea of Modern Art: Abstract Expressionism, Freedom and the Cold War, trans. by Arthur Goldhammer, Chicago 1983. Guilbaut’s geopolitical study of the rise of modern art in New York documents the play of this particular Cold War idea in post-war artistic and political culture. A version of this paper was presented at the symposium Lawrence Alloway Reconsidered held at Tate Britain on 30 March 2011, which was organised by Courtney J. Martin and Jennifer Mundy in collaboration with the Getty Research Institute. Special thanks are owed to Courtney J. Martin, Assistant Professor in the History of Art at Vanderbilt University, for coordinating and editing the group of six papers on Lawrence Alloway in Tate Papers no.16. Eric M. Stryker is an Assistant Professor of Art History at Southern Methodist University, Dallas. Eric M. Stryker, ‘Parallel Systems: Lawrence Alloway and Eduardo Paolozzi’, in Tate Papers, no.16, Autumn 2011, https://www.tate.org.uk/research/publications/tate-papers/16/parallel-systems-lawrence-alloway-and-eduardo-paolozzi, accessed 19 April 2019.